The best way to live a fit and happy life despite your daily inconveniences to boost your natural immunity and enjoy some remarkable tasty and nutritious dishes is Lemon Coriander Soup. 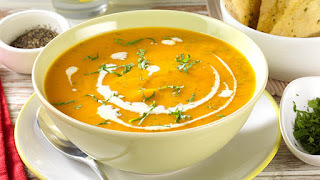 It is an amazing appetizer and the vegetable stock used in this soup helps to boost Vitamin C levels in your body. The apt reason to relish this finger-licking Lemon Coriander Soup is due to its high content of Vitamin C rich ingredients like lemon, coriander, carrots, and cabbage. In this winter season, refreshing combination of lemon and coriander along with nutritious veggies gives you a delicious and healthy soup that can add fun and fitness to your dull and placid life. This clear soup is perfect along with some slices of toasted bread for the breakfast. Even for the people who want to lose fat rapidly can have this soup in empty stomach for better results. The ingredients required to cook this dish are highlighted below. Take a note of the ingredients before you start cooking so that you have everything in place for a healthy and nutritious appetizer. Take 2 small whole sized lemons and ½ cup of fresh coriander leaves. 2 medium sized onions and 6-7 cloves of garlic. 3 medium sized tomatoes, 1 cucumber, and 1 large carrot. 3 green chilies and 2 tbsp. of corn flour. 1 tbsp. of salt as per your taste. 2-3 cups of fresh vegetable stock to add in soup. Squeeze the juice from the 2 fresh lemons in a bowl. Chop the coriander leaves and peel off the garlic pieces preferably in thin round pieces. Also grate the cucumber and onion pieces. Chop the green chilies and discard their seeds. Take the carrot and cucumber and grate it well in fine pieces. Chop the tomatoes in small cubes and mash them or grind them in a mixer to make a smooth and thick tomato paste. Heat the sunflower oil in saucepan over moderate and high flame. Add the finely chopped garlic and green chilies and sauté them for some 15-20 seconds. Keep them sautéing until the garlic pieces turn slightly golden brown. Add the chopped onion in saucepan and fry it for a few minutes. Add the grated cucumber and carrot in the heated saucepan and mix it well with the mashed tomato paste. Cook the whole mixture for some 4-5 minutes. Add lemon juice and vegetable stick in it and mix them well. Dissolve the corn flour in some water and pour it in the mixture. Add salt according to taste and mix the whole and leave it for boiling. Keep stirring it in regular intervals. Add the shredded coriander leaves over the mixture and mix them well. Cook for another 10 minutes and serve hot. Lemon Coriander Soup makes for a great evening appetizer and it is enriched in dietary fiber, iron, potassium, calcium, and vitamins. It serves as one of best antioxidants and hinders fatal illness like cancer. This simple yet so nutritious lemon coriander soup takes just about 20 minutes to cook but you must be careful enough to stir it well to avoid forming of lumps in the soup. You can replace the sunflower oil with vegetable or sesame oil and also add cabbage. Add more water and vegetable stick and water if you want a thin soup. So get started with preparation of healthy and tasty soup and cheer your family with a brilliant appetizer. It will add to your health and will give immense pleasure to your taste buds.